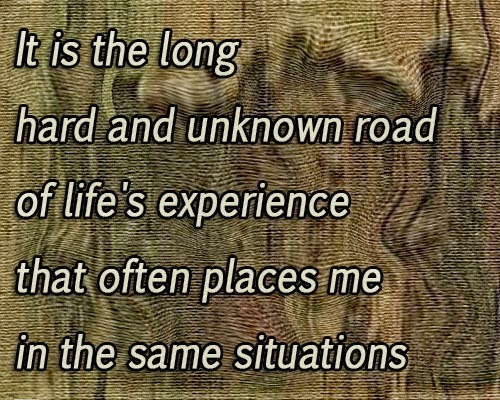 The long unknown Road in life often hard in places an situations amongst others in the same situation the long unknown hard road in life.. .. Experience often a hard lesson in life considered the long and unknown Road of hard knocks in life other people find themselves in the same situation but most importantly..
Own self the long hard road with the knocks of other people on that same hard road knocking life in general lack experience in life to make a wise choice.. When it comes to the unknowns in the life, the long hard road only needs to be a knock once in life..
Own self the long road in life will give you experience if you accept own self.. I understand that no road is always best choice if the information of, older wisdom has the experience, always ask a wise choice from the wisdom in life..
Own self expects and accepts the hard knocks of life it’s what gives the experience.. Own self smart to recognize the same situation as other people in life have experienced as a hard knock.. Own Self will ask their wisdom of the experience in the hard-knock in life..
OWN SELF ,EXPERIENCE, WISDOM TO ASK. Own self life has the experiences of the same situation is when you recognize that same road to be a long hard road and you have an acceptance of own self I recognize not every experience will be the same for everybody at the same time the road is long and it is hard but it is the wise one of our own self to ask before walking down a same situation that long road of hard knocks experience and the wisdom to ask, Wise Own Self. If you don’t ask you’ll never know. The answer will always be no if you don’t ask ..